United States Mint Deputy Director Richard A. Peterson gave collectors some welcome news Friday when he announced a forthcoming American Silver Eagle 25th Anniversary Set. The first three coins were foreseeable as they have been around as an annual offering from the inception of the Mint’s American Eagle program or, as is the case with the 2011-W uncirculated version, since 2006. The first two coins listed above are already available individually. The United States began selling the bullion 2011 Silver Eagle through its network of authorized distributors on January 3. The collector proof version was released on June 30 for $59.95. The third uncirculated 2011-W Silver Eagle is scheduled to launch September 29 for a yet-to-be announced price. If the last two coins are minted only for the set, they would be key in a collection due to their limited mintage alone. The Mint has indicated that it will only produce 100,000 of the American Silver Eagle 25th Anniversary Sets. The coins would only fall behind the 1995-W Proof Silver Eagle as the least minted in the history of the twenty-five year program. Records show that 30,125 of those were sold to the public. They now can go for several thousand dollars each on the secondary market. American Silver Eagles date back to 1986. That year saw the release of the first bullion strike as well as the first proof. Those two annual coins were joined in 2006 by the first uncirculated issue. 2006 was also when the Mint released a special reverse proof, which has a frosted background with a polished, mirror-like foreground. It was only available for a short time, was struck in Philadelphia, and could only be purchased through a limited mintage set that celebrated the Eagles’ 20th anniversary. 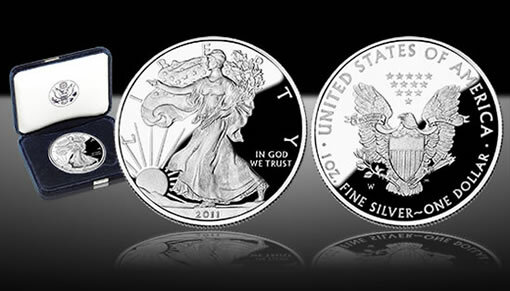 The uncirculated American Silver Eagle coins carry mintmarks and have all been manufactured at West Point in 2006, 2007, and 2008. None were produced in 2009 and 2010. Although the San Francisco Mint is no stranger to Silver Eagles, the "S" mint mark on the uncirculated version in the anniversary set would be a first. From 1986 to 1992, proofs were struck at San Francisco, and more recently, as of May 31, extra bullion coins were produced there. Bullion coins, however, do not have a mintmark. Since their introduction twenty-five years ago, Silver Eagles have contained the same obverse and reverse designs. This includes the obverse Adolph A. Weinman image of "Walking Liberty" that was first designed for the 1916-1947 silver half dollar. It is joined on the reverse by a heraldic eagle with shield design created by John Mercanti. According to the Mint’s announcement, all five coins in the 25th anniversary set will come in one hardwood presentation case that has been specially designed for the collection. An issue price has not been stated. With its limited availability, unique strikes, and a household order limit of 5, the anniversary set is expected to create a bit of hysteria upon release, much like the mania the Lincoln Coin and Chronicles set stirred up in 2009 with its 50,000 limit. Initial demand for Lincoln five-coin set brought the Mint’s ordering system to a standstill during its first few hours and within 30 hours, orders hit their maximum level. Anyone heard when in Oct.? In the interest of collectors,considering the limited availabilty of the anniversary set ,the household limit of 5 should be reduced. When in October, anyone know? James AND Jim want to know! Thanks! No more than two to a house hold give me a chance. More information should be available soon. As of Oct. 10, there is word yet on price or a release date. The last I heard it was to be released on October 27th….don’t know how true that is but hope it helps.